Whether you decide to put a television on a patio, an outdoor deck or by the pool, the KHOMO GEAR TV Cover provides All Season Protection for your valuable Flat Panel TV. Engineered to withstand harsh conditions from the scorching sun to the unforgiving cold. You can rest easy knowing your TV is protected All Year round against dust, insects, UV Rays, ice and condensation with this TV Cover. This KHOMO GEAR TV Cover has a unique feature: A Front Polyester Flap that easily flips over to uncover a Clear Vinyl Film that allows the option to watch TV with the cover on. Best results at night as glare can be created by clear vinyl during daytime. The KHOMO GEAR TV Cover is made of a unique material that allows it to 'breathe' while keeping out water, wind and moisture. This material will not allow mold and moisture to build up; preventing any damage to your TV that may arise from condensation. The KHOMO GEAR TV Cover is very simple to setup. Just Cover starting from the top and a 3-Way Flap on the rear of the cover easily fits almost every wall mount. A Handy Waterproof Remote Control Pocket is also included in the back. Make it LOOK GREAT when the power is ON and OFF! 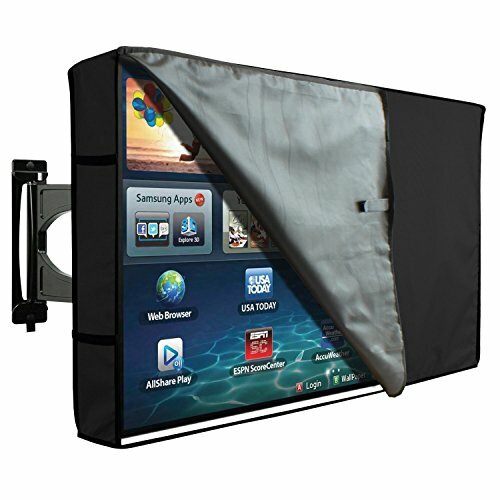 Protect your Precious TV with a KHOMO GEAR TV Cover! UNIQUE FEATURE: Front Polyester Flap easily flips over to uncover a Clear Vinyl Cover allowing the option to watch TV with cover. Best results at night as glare can be created by clear vinyl during daytime.